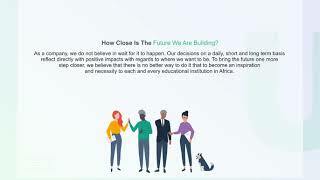 Userlance Africa Re-defining Africa’s Business Environment & Educational System Through Modern Technology. As a company, we believe that the basic drivers of every economy in the long term are education and businesses. After several years of studies, we can confidently state that the problems we identified with Africa’s socio-economic developments are due to the current educational system and the business environment. Generally, the method of education available in Africa is outmoded because of the absence of modern technology and the latest human interaction and teaching methodologies. In the long run, this has a massive effect on the type of graduates we produce, how well they would perform at what they were trained and certified, the types of businesses they would build, and how those businesses would compete on a global scale. can create an available space for everyone to set up their businesses, work or collaborate with other businesses and experts without any challenges is one of the key problems that every business in Africa faces. In charge of the principal source of leadership to the board of directors to ensure the company's evolution into a successful brand. I lead the tech, business development, sales and marketing strategies departments and oversee the execution of the company's short and long term business plans. I help ensure that the company's relationship with its clients stays as a top priority. I oversee all heads of departments' activities and take part in drawing down innovative strategies.